I've contributed a Hardsparrow track to an album called Beef Scratchings, compiled from the home recording efforts of various denizens of the Fence Records forum, the Beef Board. It's an interesting mix of stuff, from folky acoustica to austere electronic beats, though all with a pretty chilled vibe. My contribution is an early version of a tune called Handwalker, which should eventually turn up in more polished form on the Sea Tractor album. 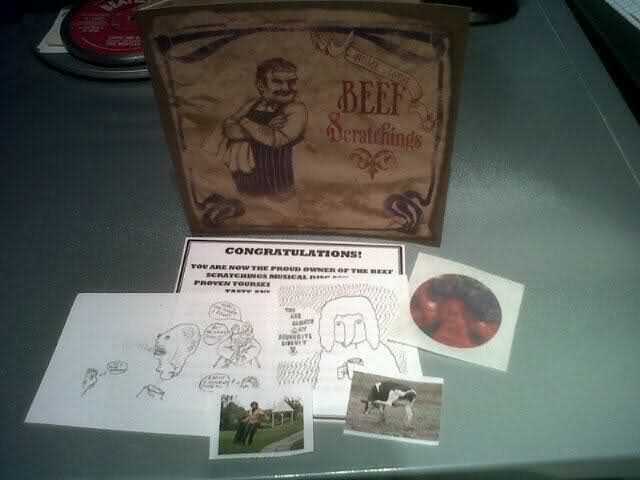 The CD packaging is really very beautifully designed, and also contains the odd (=very odd) sticker, as well as a random selection of doodles by the likes of myself and Heinz Junkins. The album is available by donation, with £5 a suggested figure, though anything is acceptable. The proceeds are going to the fund to fix the roof of the Hew Scott Hall in Anstruther, the epicentre of Fence's reknowned Homegame events, and a venue very close to my heart. Simply send a self-addressed size 0 (or larger) jiffy bag, with well-concealed cash money $$$, to Mr. Crivvens, 13 Emsdorf Road, Lundin Links, Fife, KY8 6HQ.